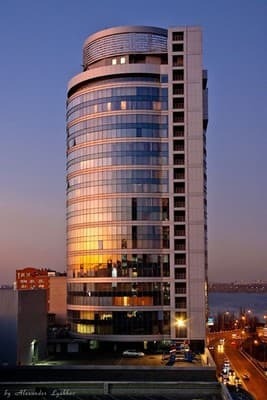 The hotel is located on the 19th floor of the Bridge City Center, which stands on the banks of the Dnieper. 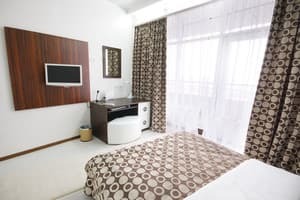 The hotel offers 6 rooms Junior suite with a double bed, 2 TWIN rooms with 2 separate beds and 6 comfortable apartments, equipped with individual design, jacuzzi, king size bed. 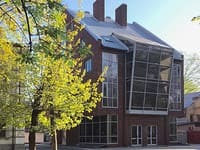 Also in each room there is air conditioning, refrigerator, TV, satellite TV. Balconies from the hotel rooms overlook the Dnieper River and the city's main streets. The hotel is located in the multifunctional complex MOST CITY, where the guest can visit the institution for every taste - restaurants, bowling, billiards, clubs, a cinema, beauty salons, boutiques and coffee shops. 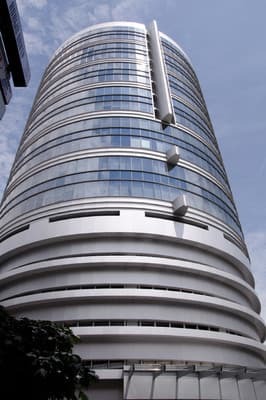 In the complex you can find branches of banks, 24-hour ATMs, taxi parking, tour agencies. The hotel has a conference room for 10 people - holding conferences, servicing buffets. The hotel offers a varied menu of breakfasts - vegetarian, American, European, Continental, Russian. The distance to the railway station is 3.5 km, the bus station 4.5 km, the airport 16 km. 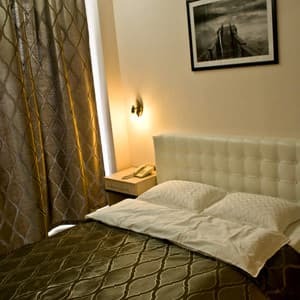 Description of the room: Comfortable room with a beautiful view of the Dnieper. In the room there are separate beds. Description of the room: The room has a large double bed (160x200). 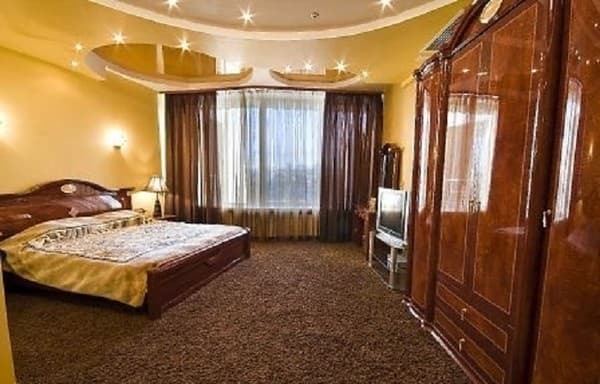 Description of the room: Room with an area of ​​15 square meters with a double bed and a view of the Dnieper. 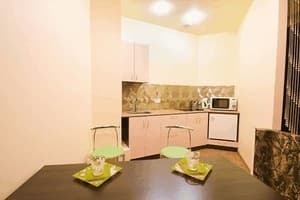 Description of the room: Apartment # 72 - spacious and elegant apartments suitable for both business trips and for families. In the room: 1 double bed 160x200, bedside light, carpet, table, internet connection (512kb / s), cupboard, satellite TV In the kitchen: microwave, refrigerator, stove, dining table, dishes C / u: shower, washbasin, toilet, towel dryer Entrance hall: closet + mirror, slippers, mitts and shoe horn. 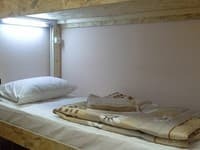 The room has a large double bed (160x200). 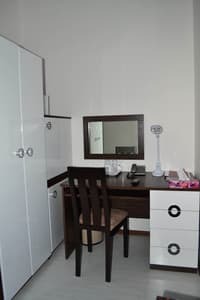 Description of the room: Room with a large double bed (160x200). 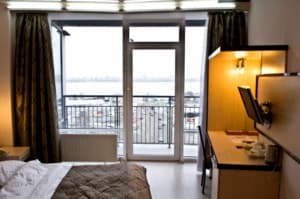 Description of the room: The room has a large double bed (180x200). 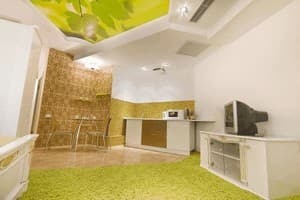 Description of the room: Spacious apartment with a double bed (180x200). крохотный номер за такие деньги. находится по сути в жилом доме. Children under 12 years stay free of charge. Extra bed - 70 UAH. per day. Breakfasts are included in the price of the rooms. Public transport: tram number 1 - to the stop Central, route taxis - crossroads st. Artema and others. Karl Marx, then go on the street. Glinka according to the signs of the city or map (on foot 5 minutes). Auto from the right bank - drive up to the end of Kharkivska street to the intersection with ul. Plekhanov. Landmark - a large city parking, shop Sportmaster, underpass, circus. Auto from the left bank - at the entrance to the city on the central bridge - after the congress the first turn to the right (at the corner of the red brick building with the advertisement of Megalink) is Glinka street. To drive around the complex MOST CITY around, being in the parking lot, left to the left is the Sportmaster store, the Sushia restaurant, to the right - the MOST-apartment building of the center, the glass entrance. For guests on the car park you can: - Become in the city street parking near the building MOST-apartment center. Enter the glass entrance, go up to the 19th floor.